« Onward Together! The Wheels are Rolling! When your family is out of town and you have a big book tour coming up, how do you spend a Saturday? 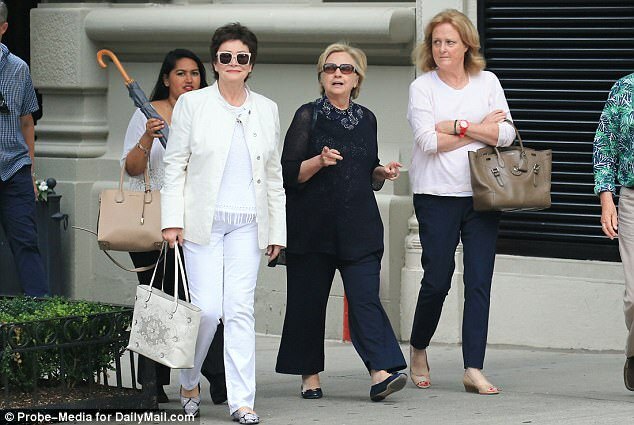 Hillary Clinton gathered a few gal pals for a shopping spree in the city. Lots of great pics here from Daily Mail. It was a girls’ day out for Hillary Clinton as she and two friends shopped along New York’s Madison Avenue on Saturday.The former first lady was dressed in a navy blue ensemble, along with black flats, as she laughed and walked on the city streets with her gal pals. Flanked by three walking Secret Service agents and two Secret Service vehicles behind, Hillary was greeted by members of the public who seemingly showed support, taking selfies and giving hugs. Wish i had been in NY city ! I am so happy seeing her out doing something totally normal! Good for her! Love it! I hope you had a great day Hillary Clinton! “…members of the public who SEEMINGLY showed support”. WTF?! Well, it’s the Daily Mail. They can be snide but they always have a lot of pics. “She entered the hotel flanked by three Secret Service vehicles.” Lol! Must have been a very wide doorway. I love the tabloids, especially the British ones! LOL!!!!! I missed that one. You idiots! these aren’t girls, they are clearly women! Nasty little digs. Grow up!